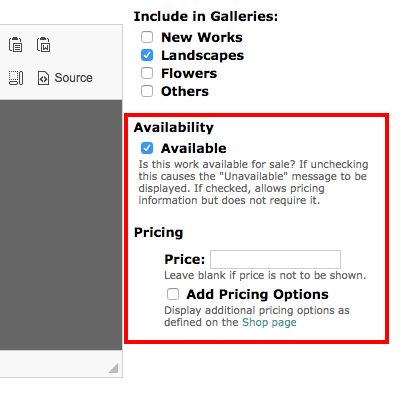 Once you have configured your website for shopping, you can add Purchase buttons to each work in your gallery. Select the work that you would like to add a Purchase button to. You should see something like the following on the right-hand side of the description field. If you uncheck the Available box, that will disable the Purchase button for that work and will display "Unavailable" on your website. If you check the work Available and do not provide a price, no Purchase button or anything else will be displayed on the website. If you check the work Available and do provide a price, that price will be displayed along with a Purchase button. If you also check the "Add Pricing Options", the Pricing Options configured on your Shop page will be merged with the price on this page, if provided, and that list will be displayed as a drop down list box. For example, you may choose to enter the price of your original artwork in the Price field and by clicking the Add Pricing Options, you can also add standard prices for a variety of other artwork options, e.g. prints at various sizes, etc. Please note you can also use the Add Pricing Options without a Price. In this case, your website will simply show a drop down list box of standard prices. This may be helpful if the original has already been sold and you're only selling prints or can be particular helpful for photographers selling a variety of standard prints and sizes.